So this is a question perhaps for the more legally minded. I am looking at opening a store, this may be online. But one of the things I wanted it to include was Lego as well as Books. Often Amazon has sets available at levels cheaper or equal to whole sale price would there be an issue with me buying them online. In say a quantity of maxium 5 or 6. Then using it to stock a shop or website. Or would I have to go through Lego? And out of interest would this be the same for the books. I am not the most legally minded person (God knows that) so I would still do more research and not just use my judgement but I see nothing wrong with that. For example I go to the flea market almost every weekend with a little booth and I sell stuff. Some stuff is relatively new and I buy it on the internet cheap or get some stuff in stores on good sales and I sell it. I do not buy directly from whatever company the product is and I still sell stuff. Now granted you are on a different level of it and are actually opening up a Store/Online Shop but in my opinion I think it will be fine. 1. What Amazon wants to let you do. 2. What you legally can do, per FTC and state law. As for Amazon, they are happy to sell to resellers, so long as you don't use Prime to order the items. They have an easy way to setup sales tax exempt status for resellers, so they clearly support it. As for the law... That is more interesting... The first sale doctrine basically says that once you buy an item, you can resell it without permission of the manufacture. It is worth Google searching first sale law and spending a few minutes on that, it isn't absolute and there are cases where it has been restricted, usually with imports. See the Costco vs Omega case for an example. No, you can buy it from amazon. It is what a lot of resellers do. Thanks guys that does help a lot. I have still got a long way to go before anything happens. But I wanted to double check. @LegoFanTexas thats interesting that they support resellers. I wonder if they do that in the UK? Have you a link to the american section I can look at all? /\ I don't think. I mean I bet you anything half of Amazon's market is Reseller's/Store Owners. The main issue is that if your store is successful, you will be unable to meet demand. If Amazon limits you to 2 copies of a set every 7 days, what do you tell your 3rd, 4th, 5th, etc. customer that wants that set? It'll work on a small scale, but not on a medium or large scale. @DadsAFOL I did think about that. Which is why Lego won't be the main thrust of my store. We have two shops that sell lego in my town. However I want to use it get people through the door to look at the other items. Maybe using sets to reward young readers etc. IE buy and read so many books get some free lego. But with Lego's popularity it seemed a good way to get people interested along with my USPs etc. If you are in the US, the Supreme Court ruling on the "fist sale doctrine" copyright issue could come into play. Their eventual ruling may ban the resale of copyrighted material if that material is manufactured or written in another country. ^^Then I agree, it sounds like a great solution for your needs. Just watch the prices, as if the discount is less than 15% below RRP there are other options. @DadsAFOL do you mean suppliers or something else? @Picopirate no I am based in the UK. However I have been watching that with interest. I have a sneaky suspistion that if the ruling makes it illegal in the USA and it proves a success then the idea may come over here. I don't think there is any issue with selling, however the Amazon may not be happy with it. I think it was about a week ago when someone mentioned that their Amazon account was suspended for good because they were reselling. The original poster also did some other things that was against Amazon's TOS, so that was an escalating factor, but I'm pretty sure I read in the comments that others also had their account suspended just for buying sets in quantities. LEGO also started a similar policy just a few weeks ago. There was a discussion on Bricklink where LEGO sellers mentioned that that they got a letter from LEGO they can no longer shop at the online LEGO store because they were buying sets in quantities. They didn't do anything illegal or against LEGO's TOS, they simply bought sets in quantities and LEGO seems to be wanted to stop this trend. So these are some factors to consider and perhaps source out other suppliers as well in case Amazon decides to close your account. 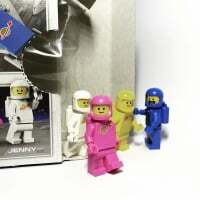 ^Using Lego to entice shoppers is brilliant. Mainly because that is what I do :) We own a Salon/Barbershop that is very kid friendly. The kids see the Legos and tell their parents that they want to see what's inside. The parents realize that it is not a toy store and say to themselves "Hey, I need a haircut and so does my child". It's great. We have tons of Lego books and models to keep everyone busy. @akunthita thats what I was thinking about when I asked the question. If I bought say 200 different books and 20 lego sets. Amazon may get suspicous. There are stockists out there but they don't offer nearly enough discount for the profit margins to be good, and for me to go up against the big stores. @Pitfall69 thoses were exactly my thoughts. Especially if it can get kids into the store and encourage them to read. I think it was about a week ago when someone mentioned that their Amazon account was suspended for good because they were reselling. The original poster also did some other things that was against Amazon's TOS, so that was an escalating factor, but I'm pretty sure I read in the comments that others also had their account suspended just for buying sets in quantities. That was a case of using multiple accounts to bypass Amazon's quantity limits, which is against the TOS. The secondary case had to do with returning too many orders, not with buying large quantities. LEGO also started a similar policy just a few weeks ago. There was a discussion on Bricklink where LEGO sellers mentioned that that they got a letter from LEGO they can no longer shop at the online LEGO store because they were buying sets in quantities. I doubt LEGO started the policy a few weeks ago. In any case, the reason the person got the letter, IIRC, was because while dealing with customer service, they told LEGO they were a reseller. ^This would be done through a single account. I wonder if it may be worth talking to amazon and seeing if like @LegoFanTexas says they would support a reseller. I'll take this bet... but how do we determine who's the winner? I am a lawyer and @legofantexas is correct. From a legal perspective, you are within your rights to resell durable goods once you have legally procured them. The recent Supreme Court arguments were about genetically engineered soybean plants and whether farmers could resell seeds that the plants generated. The holding would have an effect on intellectual properties that required licenses like software, music, digital print, etc. Thanks @wagnerml2 so if they tried to shut me down they would have no leg to stand on. A large company does not have to have a case to shut down a small company, they just need much deeper pockets and better lawyers. If LEGO sued you, do you have $20K to start your defense? It is really expensive to win court cases. Just something to keep in mind. Also, Amazon is another issue. Sooner or later, I expect LEGO to ask Amazon/Walmart/Target/etc. to stop selling to people who are known resellers. Since I have a sales tax exemption on file with all three, all three know I'm reselling. Of the three, Walmart is the most likely to tell LEGO to pound sand, but Amazon is known to work with manufacturers on such things. There is nothing illegal about Amazon refusing to sell to me because they have a contract with LEGO that says they won't sell to resellers. Amazon can do nothing about past sales, but they can stop future ones. I have already started to scale back my LEGO business for just this reason. LEGO has clearly decided to crack down on resellers. The recent change in the LEGO stores from 5 qty of an item per visit to 5 qty of an item forever is an example of this. The recent e-mail I received from [email protected] that said they believed I was reselling and any future bulk orders could be canceled is another example of this. If LEGO doesn't want us doing this, they can't stop us outright, but they can make it much harder. At some point, I have no desire to fight a billion dollar company that doesn't want me playing with them and is willing to spend time and money to make my life difficult. ^^5 copies max forever? Are they really going to enforce that? If I buy 5 copies of X set today, I can't buy more, ever... Not even a year from now. When I looked at her funny, she repeated, "yes, that is the new policy, and yes we'll have to enforce it, and yes, if I catch someone trying to get around it by coming in at different times, I'll have to ban them from the store." No doubt was left in my mind that they are very serious about this. ^What percentage of LEGO buyers are bulk/reseller/>5 copies types of buyers? If this limit is enforced, would LEGO notice the drop in demand? Or do they sell too much volume to even notice this? For the record I collect sets (1x each) and do not resell; just curious! @legofantexas - You are correct in your assesment of the practical approach, I was merely commenting on the legal approach, there is no behavior here that would be directly actionable with a legitimate lawsuit, although that would not preclude Amazon from refusing to sell (although not sure why they would) or Lego from trying to attempt a legal war of attrition. The one item I would be weary of is that I have never seen a distribution agreement from TLG. It is possible that a distibution agreement between TLG and, say, Target or TRU, might have some kind of clause that would preclude TLG from allowing other distributors within a radius of a distibution point (Obviously they could except out other boxed retailers). But TLG could be obligated to not allow a mom and pop toy store from buying direct from TLG if they are within a radius of a licensed distributor. TLG could be under a legal obligation to prevent that from happening. This would be highly dependent on language that I haven't seen and highly dependent on whether the distributor could force TLG to action against a 3rd party under terms af the language that I am supposing. Long story short, I advise commercial clients all the time. If this arrangement meets you financial needs, you should be OK. I was sued once by someone I was leasing equipment from. Long story short, we had talked about an hourly usage rate and a monthly guaranteed usage rate. There were witnesses to this, as well as written e-mails discussing it with various numbers tossed back and forth. The final signed written agreement that was dated AFTER all of the above negotiations clearly stated that it was an hourly agreement with no guarantee and that any prior discussions did not count towards the agreement and only a written amendment signed by both parties could alter the agreement, that there was no verbal or implied agreement. He sued me because in his mind, he thought I *should* be paying a monthly minimum regardless of what the actual written agreement said. He felt that it was implied, even through the agreement clearly said otherwise. My lawyer advised me that it was as close to a slam dunk case as it ever got. Nothing is ever "for sure" when you go before a judge, but clearly I *should* win. The contract was actually very clear, the dates on everything lined up perfectly, the evidence was simple enough that even a lay person should be able to understand it. Any talk of Amazon or Lego suing you for buying product from them for resale is a bit far-fetched. If you run afoul of their TOS, they are just going to shut you down and stop selling to you...suing you would be a complete and utter waste of money with absolutely no financial upside for them. However, both companies have well-tuned policies and mechanisms for limiting the amount of product that any one individual can buy...so I would say that, as a general rule of thumb, if you can buy it from them, you can resell it without any worry whatsoever. The people who get nasty letters or get banned are the ones who try to skirt their limits and get caught doing so. And the whole issue of the first sale doctrine and copyright isn't something that is likely to come into play here. The case currently before the Supreme Court has to do with the question of whether the first sale doctrine applies to copyrighted works purchased outside of the U.S. Basically, the question is whether a copyright holder (say, TLG) could use its copyright over a creative work (say, an instruction manual in a Lego set) to prevent someone who purchased the work outside the U.S. from reselling the work in the U.S. This only happens when you have a pricing imbalance that runs in favor of the foreign country (i.e., cheaper to buy overseas than in the U.S.). With Lego, however, it seems as though sets are always cheaper in the U.S. than they are overseas so it would be a bit pointless to buy them overseas for resale in the U.S. (excepting of course the situation where a set is only available overseas). I haven't heard of the "5x ever" policy here in CA. Is that aimed at specifically "known" resellers? Or is that supposed to apply to anyone? One advantage here is that I have 4 LBR locations plus LLCA within driving distance, and another couple LBR locations within an extended drive, so that would make the rule hard for them to enforce. This could definitely affect the aftermarket. ...suing you would be a complete and utter waste of money with absolutely no financial upside for them. Any talk of Amazon or Lego suing you for buying product from them for resale is a bit far-fetched. For buying, I agree with you, they'll just stop selling to you. If you setup a web site, or a store, or some other visible business and you're selling LEGO, that is another matter. If I setup a web site to be the "ultimate LEGO shop", they might well take it another step. My understanding is that if the item itself is made outside of the USA, then it doesn't matter where it was purchased. "However, in John Wiley & Sons Inc. v. Kirtsaeng (2011), the 2nd Circuit went further than the 9th Circuit in limiting first-sale doctrine by holding that first-sale doctrine does not apply to goods manufactured abroad, even if they were manufactured and imported into the US with copyright owner's authorization." The way I read that, it doesn't matter if you buy the items at your local Walmart, if they were manfactured abroad, first-sale doesn't apply. wow, this is the first I've heard of this. I know they cut the 5/visit limit down to 2/visit, but haven't heard of 5/lifetime. The 2 per visit limit is only for brand new items that are in hot demand, at least that is the rule here. The 5/lifetime is a new thing in the past month. I agree, you would have to be going well beyond this limit to become obvious about it. Of course, if you have a VIP card, they can link it to that, so you could buy without VIP at different times. Consider that regular buyers quickly become "known" to the store employees. 18 months ago I was just anther LEGO fan to my local store. But at some point it becomes obvious who is a reseller. Anyone buying 10x of this and 20x of that is, quite simply, a reseller in most cases. Because companies do strange things, why they wouldn't want to sell more when they don't have a stock shortage is quite beyond me. I totally get limits around Christmas and when something is new and hot (like Minecraft). But if I wanted to go buy 50x copies of Death Star, why on Earth would they care? There is clearly no shortage of that set and I'm not even getting a discount. But those are the rules. ^ oh absolutely. I know all the store associates by name and vice versa. I guarantee they all know I resell - heck, I'm not hiding the fact. I always respect the limits and I don't try to game the system. With some exceptions, resellers are mostly filling holes in the sales process that LEGO themselves cannot or will not fill - and in the end, more LEGO gets sold than would have been without me and others like me. What do I get out of it? 5% VIP to go spend on more LEGO for myself. And apparently the ill-will of the company I spend a lot of money (my own, not just my customers) on. ^ I suspect LEGO cares much less about retired products being resold than they do about current products. If resellers buy up all of a hot product for Christmas, something that LEGO is currently marketing, and the only place to buy it is third party sellers for 3x retail, that would piss off LEGO. Minecraft is of course the obvious set and it might be the reason this came about. ...Also, Amazon is another issue. Sooner or later, I expect LEGO to ask Amazon/Walmart/Target/etc. to stop selling to people who are known resellers. Since I have a sales tax exemption on file with all three, all three know I'm reselling. Of the three, Walmart is the most likely to tell LEGO to pound sand, but Amazon is known to work with manufacturers on such things. To be honest I already assume all the large retailers tell Lego to, "pound sand". TLG would not be that happy that Amazon & TRU US are selling and shipping Lego to Australia a lot cheaper then our RRP and I'm also sure that local retailers via Lego Australia complain to TLG about it happening. I almost guaranty TLG has asked them (Nicely) not to, and I'm almost sure that the response would have been "..or what!!". It's not like TLG can say to the big 3 "..we wont sell you Lego any more if you continue". I'm pulling a number out of the air but I assume that they account for at least 15%-30% of all world wide Lego sales. Yeah, but ultimately you have to have someone at the company who is willing to foot the bill for the litigation and most companies -- at least the smart ones -- generally don't go around paying lawyers to litigate cases without some business justification for doing so. There are certainly plenty of companies out there who get bad advice and get involved in litigation that is ridiculously stupid (I'm fighting one right now), but, by and large, companies don't like to pay lawyers for litigation that they can avoid. Sure...at that point, you'd be violating their trademark and they'd have to sue you in order to protect their IP. I'm representing a company right now that is having to do this. That's right...I was being sloppy. The issue comes down to how the statute that codified the first sale doctrine was worded. The statute was worded such that the first sale doctrine only applies to works "lawfully made under this title" (i.e., the Copyright Act). The argument, as I understand it, is that any work manufactured outside the US cannot be considered "lawfully made under" the Copyright Act and, therefore, is not subject to the first-sale doctrine. I'll be interested to see how the court resolves it. If they side with the textbook company who brought the lawsuit, it will effectively create a loophole that will swallow one of the basic principles of copyright law in the U.S.
To a point, yes... but keep in mind that the "standard discount" is 30% off RRP. But there are ad co-op dollars, rebates for volume, and other ways to make it cost less without invoicing it for less. Technic is exclusive to Toys R Us in the United States. Clearly TRU had to do something to get that right. What if Target and Amazon agreed to do as LEGO asks in return for taking Chima away from Walmart? Or selling it to them for 5% less? As the saying goes, money talks and birdseed walks... :) It doesn't have to be an all or nothing thing. The flip side is... Does Walmart and Target really want a bunch of people competing with them? They probably don't care when the clearance stuff goes out in bulk, the whole point is to clearance it. But when they do normal sales, those are perhaps more intended to generate additional sales from normal customers, not to generate 50x sales from someone only buying sale items. Rolex is very protective of their authorized dealers, which is why there are so many sellers of "used Rolex watches", even if they are new. Because they can't sell them as used and use their mark, or so I understand, but they can sell used all day long. If LEGO ever decides to enforce the issue, could they ask eBay and Amazon to no longer allow LEGO to be sold in "new" condition? They probably can't restrict used listings, since that falls under first-sale, but they can restrict new sales, or so I understand. Amazon already does this for some manufacturers. Just try to sell a HBO or WB DVD set on Amazon as new, most are now restricted to used only for anyone who isn't an authorised distributor. If that ever became the case, I would think it would matter little since it would apply to all third party sellers across the board. Instead of "new" sets we would be selling "factory sealed/unopened" sets. Wouldnt the easy path be just to open a wholesale account with LEGO? Is it really that much cheaper and easier to buy from Amazon instead of from the source? Is it even possible for a smaller store or seller to get a LEGO acount?. ^^ Its not that easy. My understanding is you just can't sign up for and account and that the minimum requirements for acceptance of product is really high. I also understand that you don't get to pick your inventory, they pick it for you. No sure if this is factual, just want I've been told by a local independent toy shop that recently gave up their LEGO account. My comment is comparatively mundane, but it illustrates the role of Amazon as supplier. I was looking around for shipping tape and tried Amazon; they offer a discount if you sign up to have cases of it delivered regularly. To me, that says "we want to be you're supplier!" Yes, yes, it's just tape, but still somewhat illustrative. First, you can't JUST sell LEGO, that is what the LEGO stores are for and what Shop @ Home is for. They don't want LEGO to be 51% or more of your business, better if it is 20% or less. Second, you must have an actual brick and mortar toy store that is open to the public. You can't just sell toys online, they have plenty of people doing that and don't need more. Third, the actual dollar amount that you "must" purchase is amazingly low, $10K for the first order and $5K for each additional order. They are there to support small toy stores in small towns that don't have 10 Walmarts within 15 minutes driving distance. What they don't need are more toy stores in the big cities. Dallas has PLENTY of places to buy LEGO, they don't need more here. Fourth, the actual discounts are not that great. Generally you get 30% off most items, up to 38% for some items (Duplo, Creator sets, etc.) Used to be Technic as well until that became TRU exclusive. Fifth, you can't buy anything that is a "Hard to Find" or "Exclusive" as listed on Shop @ Home. This means no Modulars, no Death Star, no store exclusives, no Technic, etc. Sixth, they charge 10% of the order price in shipping. So that 30% discount just became 23%. And you're expected to accept that not everything will show up in perfect condition, sell it as damaged box, they don't want to hear about it. Seventh, you can place any order you like, what they actually decide to send you is their choice. When supplies are tight, you're the last person they ship to. You might get half of your order, and not the good half. Unless you're placing $100K orders at a time, don't expect great service.